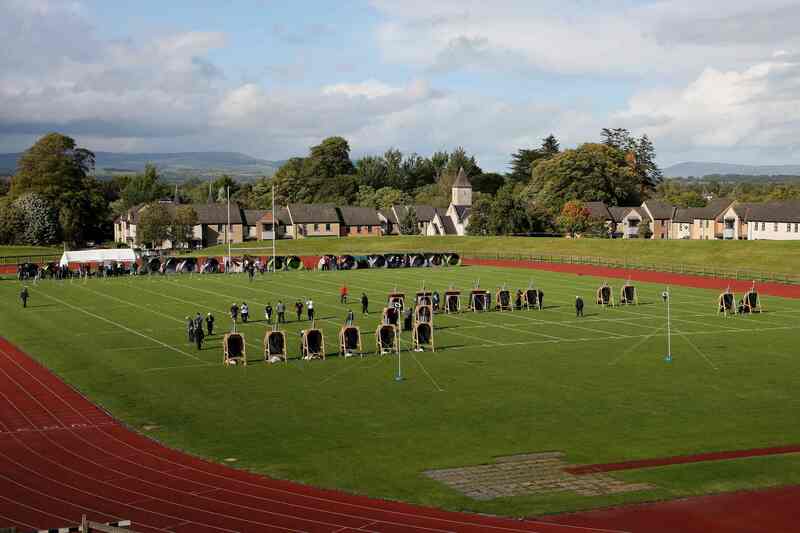 The first weekend of September saw the 2011 Outdoor Archery National Championships brought to the University of Limerick for the very first time. With Limerick named as the 2011 European City of Sport the UL Archery club worked tirelessly to bring the most contested competition of the Irish archery calendar to the Arena Bowl. This was the first time that the Arena Bowl has ever held an archery event and to bring such a prestigious shoot to its archery debut was a wonderful honour for the club. Saturday saw the 2011 UL Outdoors being shot at a fixed distance throughout the day with a double 70m round for recurve archers, a double 60m for cadet and master recurves and a double 50m for all compounds. First place titles in recurve went to Keith Hanlon – senior male, Sinead Cuthbert – senior female, Peter Cummings – junior male, Jim O’Connor – master male and Katie Hamilton – 30m beginners. The compound titles went to Colin Griffin – senior male, Deirdre Rogers – senior female, Richard Delaney – master male and Orla Barber – cadet female. Full results can be found on the 2011 results page. 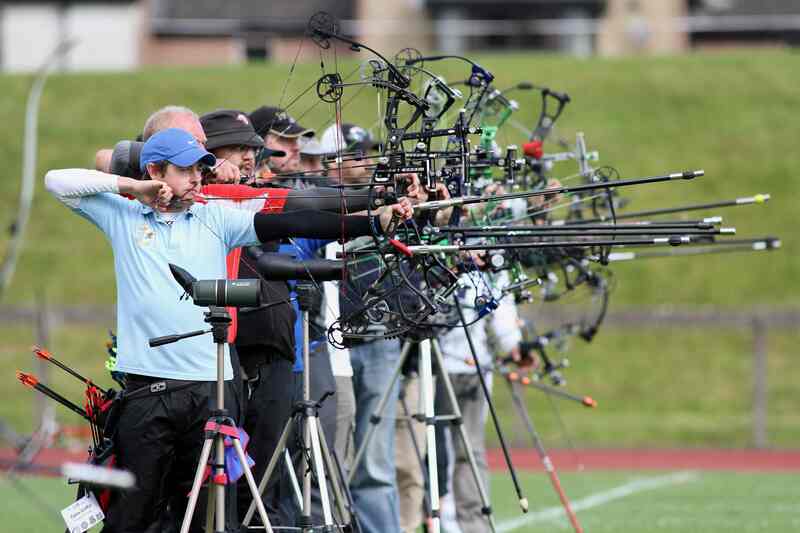 With perfect shooting conditions holding throughout the day a number of new Irish records were also set on Saturday. Unfortunately good weather conditions did not continue for Sundays IAAA 2011 National Championships. 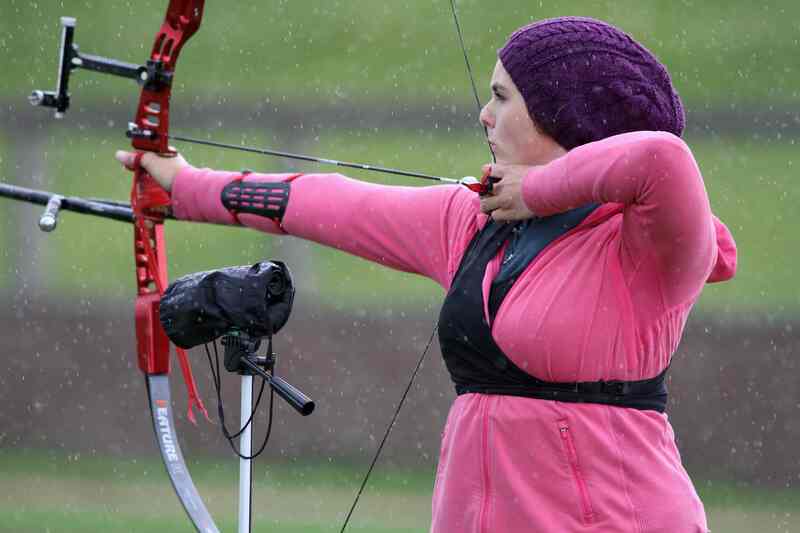 Archers battled gusty showers while completing a 72 arrow qualifying round during the morning stage of the shoot. Although the afternoon’s head to head stage saw no improvement in conditions a number of archers fought some extremely tight competitions to progress to the next round. One of the most notable matches was a phenomenal shoot off early in the competition between Dun Laoghaire’s Joe Malone and UCD’s James Ryan. Things were just as heated on the compound line (see picture below)with a quarter final between Colin Griffin and Martin Wilkinson tied on 132 and forced to a shoot off. Michéal Irwin and Peter Cummings also got their own shoot off in the junior male recurve finals. 2011 saw a number of archers retaining their titles with Keith Hanlon securing senior male recurve ,Tara Purcell holding onto senior female compound and Sinead Cuthbert retaining her senior female recurve title. Rohan O’Duill – senior male compound, Michéal Irwin – junior male recurve, Aisling Finn – junior female recurve, Niall Boland – junior male compound, Tom Meade – master male recurve, Enda Coffey – master male compound, Patrick O’Sullivan – cadet male recurve and Orla Barber – cadet female compound, all found their places on Sunday’s podium. The weekend’s event was thanks to more than UL Archery and they would like to give sincere thanks to all of the clubs, archers, stewards and volunteers who gave their time, expertise and equipment in order for this competition to take place. A gallery of the weekends events can be found at http://johnhalas.zenfolio.com/p456507475 thanks to photographer John Halas. John has published some fantastic images like action from the female recurve category from Sundays shooting ( Maeve pictured above) John has also kindly supplied the images for this post.